I am so going to cook frittata for dinner more often. Damn this was good. Fry leeks and spinach over medium heat until the leeks have softened. Scatter the cheese on top of the vegetables. Whisk the eggs with cream and pour into the pan. Push the mixture down into the egg and turn down to low heat. Cook till the egg starts to bubble and then transfer to the oven and cook until the egg is set and the top is nicely browned. Tom has requested that next time we try fetta instead of blue cheese, which I must admit would make it more kid friendly and will no doubt be just as scrumptious. 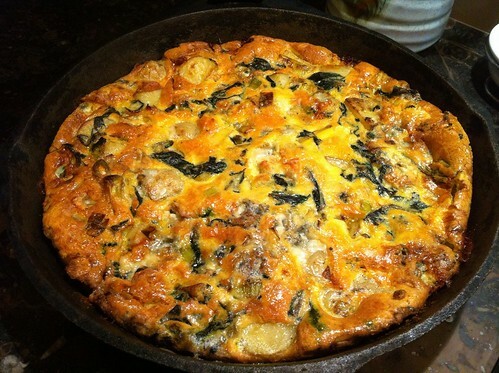 Of course there are endless variations that work in frittata – mushrooms being one of my favourites.